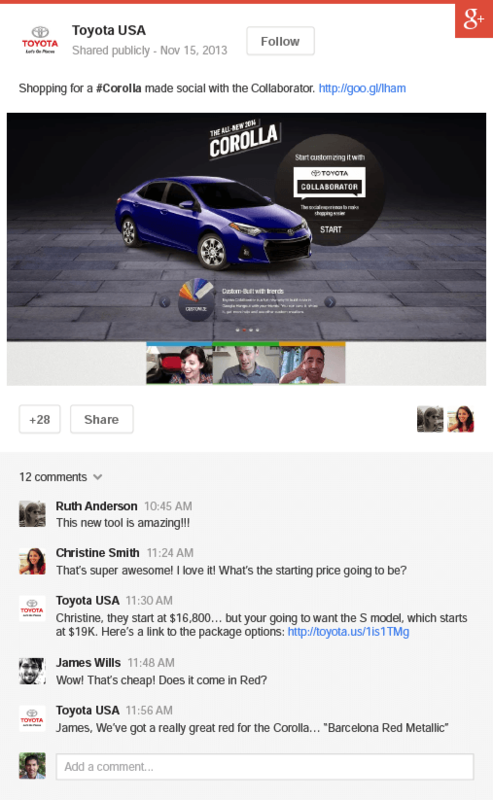 Google is doing a thing that was probably inevitable with its social network Google+: It’s testing a new +Post ad system in the form of promoted posts that translates public Google+ content from their brand sites into a display ad that can run across Google’s Display Ad network. The company announced the pilot program via G+ product manager Eran Arkin’s page on the network today. Arkin touts this as a way to encourage higher click-through rates, and generally boost engagement by providing a way for the audience to reshare video content directly from the ad, leave a comment or question that will be answerable via its G+ account, or even start a Hangout instantly to chat with someone live. It’s early days in terms of solid metrics, but Google is claiming that these +Post ads have expansion rates (how often an ad that expands when interacted with is actually expanded) 50 percent better than the current average for rich media advertising, which sounds promising but ultimately doesn’t say much. You can see how brands are using these in the video above, but essentially +Post ads expand to become full screen lightboxes, which is going to appeal to those looking to do more with design and media in their online advertising. It also benefits Google by driving engagement back to its social network, and helps them sell to brands because it eschews the question of Google+’s reach altogether by bringing that content out of the network and into the broad web via Google’s display ad network.